When it comes to children’s safety, eye care is often overlooked. One of the reasons for this is that people just assume eyesight is something that isn’t affected until old age. Then if it is, it can be improved with eyeglasses. Poor eyesight is something that can often be avoided, which is why eye safety is so important. 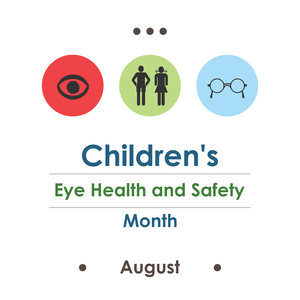 And why August is eye safety month. The reasons constant exposure to these screens could hurt their eyesight is because they emit high-energy visible blue light, which can damage the retinal tissue over the long-term. It’s important that you pay attention to the eye safety of your children since they typically don’t keep track of their time staring at a screen. They are also very adaptable; they may not notice that their eyesight is worsening. There are a few ways you can help protect the health of your children’s eyes. First of all, monitor how often they use digital screens. Limit their recreational use. You should get them into the habit of taking frequent breaks. If they are in front of the computer doing homework for hours, encourage them to get up for five or ten minutes after every hour. You should also make sure that they get a professional eye exam at the age of six months, three years, and five years. If you see that they are having issues, such as constant squinting or eye-rubbing, schedule a checkup as soon as possible. For more health advice, be sure to visit us at The Benefits Store today.